In early September 1914 a meeting was held to farewell the first group of local soldiers going to the Front. The first public meeting to establish the Avenue was held at the Bacchus Marsh Shire Hall on Monday the 24th of June 1918, with all residents of the Shire requested to attend. ...to decide on what steps shall be taken to plant trees on the main roads in honor of district soldiers. Many other places already have the work well, in hand. If advantage is to be taken of the present planting season no time will have to be lost. Council also decided to call a meeting at Myrniong to see if they wanted to plant trees locally or as part of the Bacchus Marsh avenue—they chose to plant locally. The committee held another public meeting(3) on the 15th of July, the result of which was a call for a Monster Working Bee(4) on the 3rd of August to dig the holes and plant the trees. The date of the tree planting was altered(6) to the 10th of August due to the name plates and timber for the tree gaurds not being available by the 3rd. It was now expected that 200 trees would be planted and 120 were already subscribed. Shortly before the day of the planting the number of trees to be planted had risen to 280 of which 211 had been subscribed(7). On Saturday the 10th of August 1918 over 1000 people assembled near the Woolpack Inn to witness and assist in the planting ceremony. After the relatives and friends had distributed themselves along the two mile length of the Avenue, a bugle sounded and all 281 trees were planted, with the aid of the Planting Supervisors, within half an hour(8). The trees planted were Canadian Elms - the Country Roads Board (CRB) would not allow evergreens as they would keep the road damp in winter. The CRB also insisted on them being planted 23ft. from the centre of the road, which means some of the trees at the western end encroach upon the footpath(7). 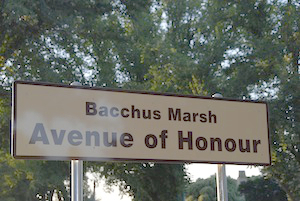 This site, proudly presented by the Bacchus Marsh RSL Sub-branch, aims to provide further details and links for the people who are remembered in the Bacchus Marsh Avenue of Honour. If you have any information or photographs you would care to share please contact us. The site relies heavily on the Australian War Memorial, the National Archives of Australia and Trove from the National Library of Australia. Also used were Archives New Zealand and the Aukland War Memorial. Between 2014 and 2018 Australia will commemorate the Anzac Centenary, marking 100 years since our nation’s involvement in the First World War. At the end of each day, commencing at 4.55pm AEST/AEDT, the Australian War Memorial farewells visitors with its moving Last Post Ceremony - lasts about 20min. A list of those who died during their service, whose anniversary is within two weeks of today's date.